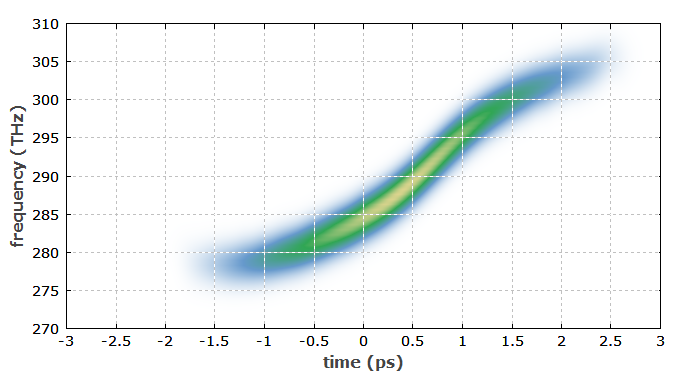 Here, we numerically simulate the amplification of originally unchirped ultrashort pulses in an Yb-doped fiber amplifier with normal chromatic dispersion. The center wavelength and mode area are taken from the definition of the optical signal channel (not shown here). As needed, one may add higher-order dispersion (possibly calculated with the mode solver), stimulated Raman scattering, more complicated input pulses, etc. Figure 1 shows the resulting amplified pulse. Due to the effects of the Kerr nonlinearity and the chromatic dispersion, the pulse has become much longer and is strongly chirped. The pulse shape is approximately parabolic. The results depend only weakly on the input pulse; for example, they are quite similar if its duration is doubled. Figure 1: Temporal profile of the amplified pulse, also showing the rise of instantaneous frequency (an up-chirp). Figure 2 shows the spectral shape of the amplified pulse. The roughly parabolic shape of the spectral phase suggests already that dispersive compression with pure second-order dispersion should be suitable for strongly compressing the pulse (see below). 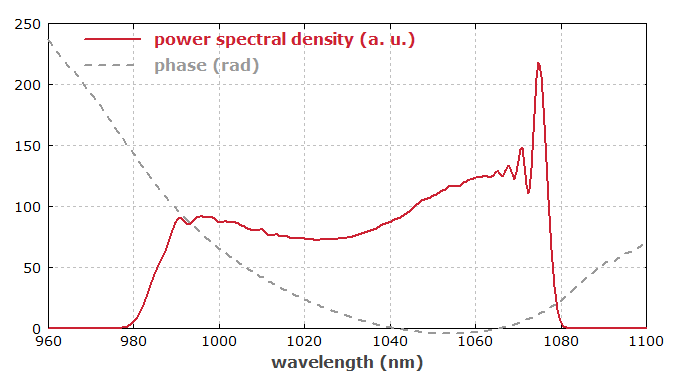 Figure 2: Spectral profile of the amplified pulse and the spectral phase. Figure 3 shows the spectrogram of the pulse after the fiber. Here, one can also see the up-chirp. Figure 3: Spectrogram of the pulse after the fiber. 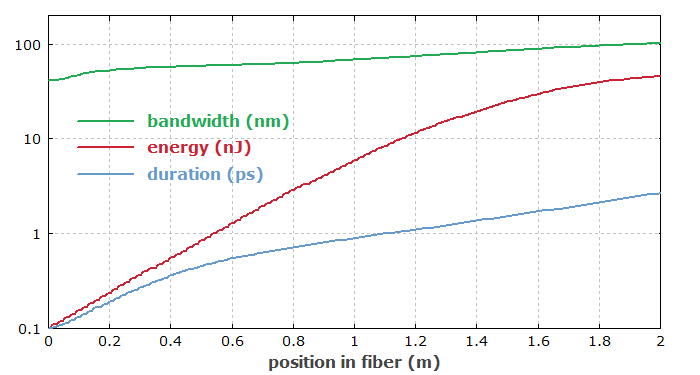 Figure 4 shows how the optical bandwidth, the energy and the duration of the pulses evolve in the fiber. The pulse bandwidth is measured on a level of 1% of the peak power spectral density (not as a full width at half maximum). Figure 4: Evolution of pulse parameters along the fiber. Figure 5 shows how the amplified pulse could be temporally compressed in a dispersive pulse compressor. 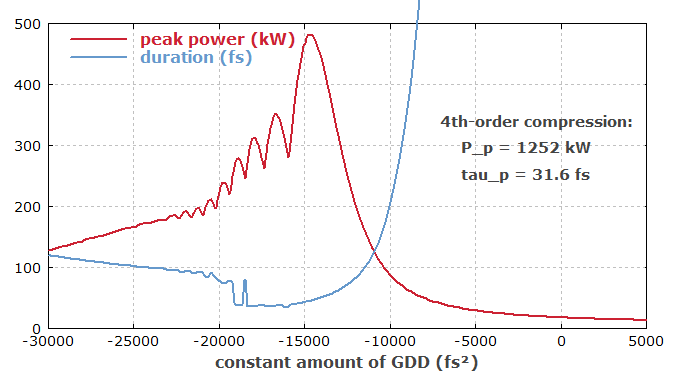 The peak power and pulse duration are shown as functions of the applied second-order dispersion. The best compression is achieved for a dispersion of about −15000 fs2. Also, it is displayed in text form what compression results could be obtained with a compressor using optimized chromatic dispersion up to 4th order. 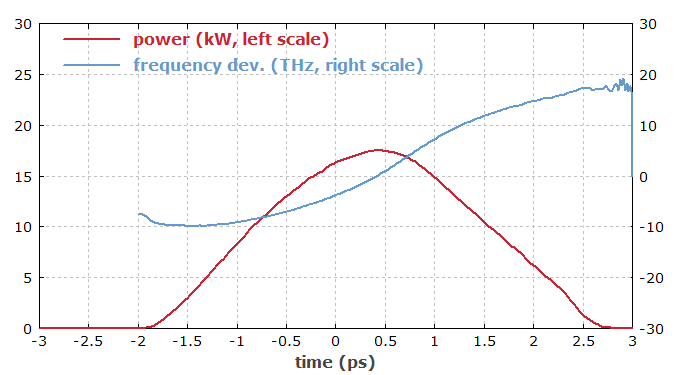 Figure 5: Peak power and pulse duration as functions of the applied second-order dispersion in a pulse compressor after the amplifier.